Here is documentation of an idea involving teacups, saucers and a teapot on a table in the middle of a park – Ashton Court Park – Bristol. 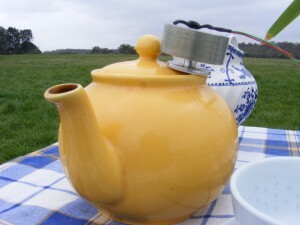 I used a couple of transducers, a geophone (or ground mic) connected to an amplifier to make some teacups rattle with live vibration -sound waves – from the ground. The vibrations from the transducers resting in the saucers and jiggling against the china, was pronounced enough to be heard clearly. 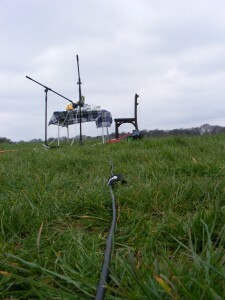 Rather than a finished piece, I wanted to try out props that I hoped would react to sound waves travelling in the ground – contrasting the domestic and the scientific. 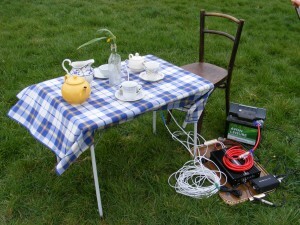 The familiar picturesque tea table scene was at odds with the more scientific and unfamiliar looking gear. It was strange to hear the sound of teacups, like they rattle on a wobbling trolley, on a static table in the middle of a park. This disconnectedness, disjointedness of the scene alerted onlookers to see what was going on –several passers by did enquire. Will- my collaborator and co documenter set up a short film clip to show how the geophone was picking up signals under foot. He wanted to show it’s direct effect on the teacups in a more obvious way. You can see the time delay of the jump and the rattling of the cups. Noticing that there are sound and pressure waves going through the ground under your feet has come into previous works I’ve done. 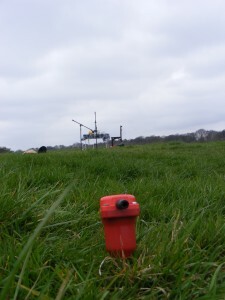 Being aware of the ground under our feet allows us to think of the park landscape differently, as the view offers not only the scene above ground but also the potential of thinking about the land that has conveyed sound from kilometres around and beneath us.